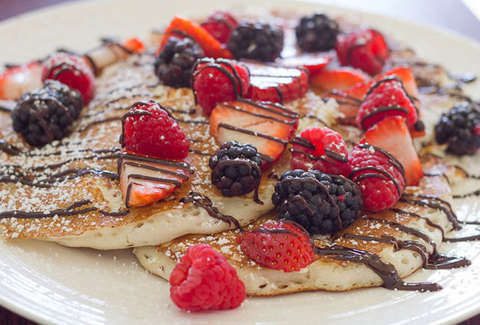 Ecco only does Saturday brunch, but they pack a lot of bang for your buck. For $5 you can choose from five crepes (strawberries & cream; bananas, brown sugar & bourbon; apple, raisin & cranberry; blueberry, apricot, yogurt & mint with honey; and spinach), three frittatas (vegetable; ham, Swiss & mushrooms; and artichoke, pancetta and Parmigiano), and biscuits with homemade chorizo gravy. Or just get a $4 mimosa and call it a day. Whether you prefer the glazed, the red velvet, or the apple fritters, you can easily get your fill of your favorite donuts and a carton of cold milk for less than $5, 24/7. There is quite a lot to choose from at Bryant’s if you only have $5 in your pocket -- biscuits and gravy, a number of biscuit sandwiches, regular breakfast sandwiches on toast, and a couple of breakfast bowls. Maybe that’s why the line is always so long? For $4.19 you can get a grit bowl. This Southern classic includes grits, scrambled eggs, cheddar cheese, and your choice of diced sausage, bacon, or city ham. Cafe Eclectic makes fresh yogurt and granola daily. The granola is made with rolled oats, flaked coconut, almonds, apricots, golden raisins, and local Quinley & Whitworth honey. The yogurt is unsweetened and made from scratch with whole milk. Topped with seasonal berries before it’s served, a cup is $3.50 and a bowl is $5. Looking to fuel up on the cheap before hitting the Greenline on your bike? Republic Coffee has you covered. 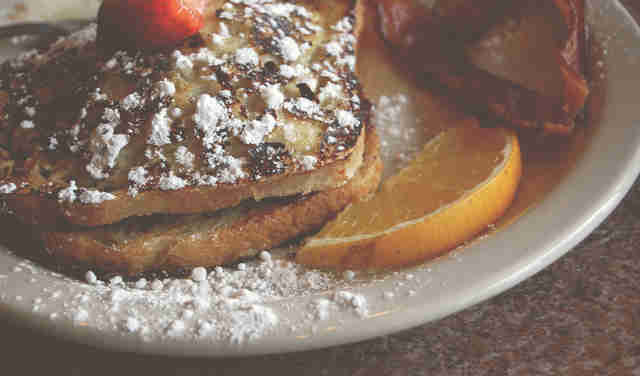 The stuffed French toast with strawberries and cream cheese and a side of hash brown casserole is a steal at $5. There are many delicious pastries to choose from at Tart, but you absolutely must try the pain au raisin. Don’t tell me you don’t like raisins. It doesn’t matter. 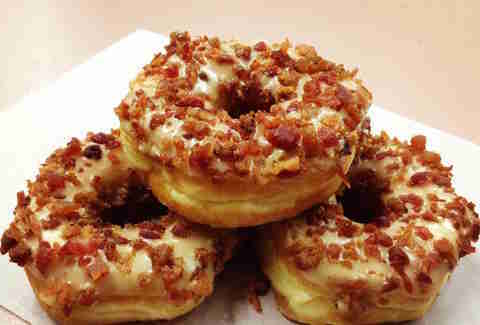 It’s sweet, surprisingly filling and far superior to a regular ol’ donut. They run $3 each, so if you want a small coffee too you will need to borrow a dollar from a friend. 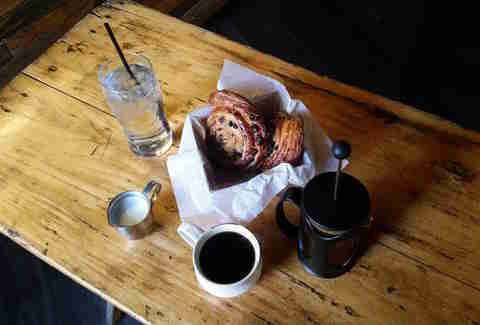 For $5 you can get an almost equally delicious croissant and an individual French press coffee. A cross between a pancake and a popover, the Dutch baby pancakes are eggy and sweet, with a hint of lemon. Definitely $5 well spent. Both solid breakfast options, the chocolate croissants and grapefruit brulees are $4 and $3 respectively. 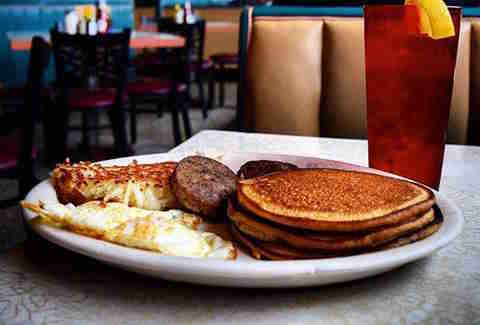 A short stack of three of Arcade’s famous sweet potato pancakes is $4.75. If you are a fan of sweet potato pie, but you're embarrassed to order it for breakfast, these pancakes are for you. All the flavor, plus fluffiness! Tops doesn’t have a breakfast menu, but they open every day at 8:30am (this is Memphis after all). Go ahead and start the day with a regular pork sandwich ($3.75), a jumbo pork sandwich ($4.85), or a rib sandwich ($4.95). Stacey Greenberg lives in Cooper-Young with her two sons. She's the author of the award-winning blog, Dining with Monkeys.